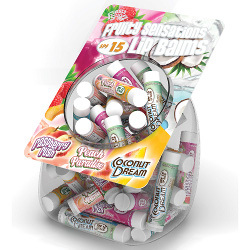 This Coconut Dream fragrant lip balm with SPF 15 is a mouth-watering, silky smooth lip balm that moisturises and protects your lips, nose and even tattoos. Fiesta Sun quality-tanning formulas are uniquely designed to exceed your tanning desires. Fiesta Sun products contain the most advanced combination of natural tanning ingredients combined with the latest science to give you the deepest, darkest, fastest tan possible while keeping your skin soft and supple.